GuitarFreaks V is a game in the popular GuitarFreaks series of music video games from Konami. It is the first game in the series which does away with the long-standing numbering system, replacing what would have been the 12th Mix. This change was brought about partly to avoid confusion with session linking compatibility with the DrumMania series. Gameplay remains the same from previous titles, with the player using a simulated guitar controller to play the notes of a chosen songs guitar part as they are displayed on the screen. 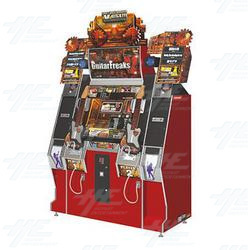 The machine can be played by one or two players, and can also be linked to Drum Mania V.
This change was brought about partly to avoid confusion with session linking compatibility with the DrumMania series. Gameplay remains the same from previous titles, with the player using a simulated guitar controller to play the notes of a chosen songs guitar part as they are displayed on the screen. The machine can be played by one or two players, and can also be linked to Drum Mania V.